Our brother, Dave Curry has passed. Leave your thoughts and memories here for all his VVAW family to see. I met Brother Dave as a criminologist first, having read respecting his gang research and his ability to translate statistics into real life stories. I only later learned he was a fellow VN vet...and when I realized he was *that* Glen David (Sunshine Patriot) Curry, I was amused and amazed. His sense of humor, his humility, and his sense of justice are the memories that will linger. Welcome back David. Namaste. I always enjoyed the times spent with Dave and feel honored to have served along with him in the National Office. May he rest in peace. On a couple of occasions when I visited Chicago, Dave went out of his way to make me feel welcome. We will miss his optimism and his smile. Rest in peace, my friend. I had the pleasure of knowing Dave through VVAW. A kind man with a wealth of experiences and great stories. Almost always with a smile on his face and a chuckle in his laugh, Dave was always willing to share his wisdom. You will be missed. I hope you have found peace. Always smiling. His great laughter will be missed. I am sure his students over the years appreciated his research and his humanity. Honored to have know him. We first meet during the 1972 GOP convention and remained best friends ever since. His experience seared his soul. He will be missed. All my love forever to you, Mule. Thanks Everyone for all your thoughts. Taps for a fellow veteran is always a sad occasion. Fare well brother David. We had great conversations.....see you Dave. by his true north we all tried to set our moral compass; he was the sanity standard when all others became eroded or compromised or rudderless. I did not know Dave, but I have supported everything he and all the brothers of VVAW have done and will ever do. Becky and I mourn the lose of another warrior for peace and justice. His smile, his laugh and his passion for justice are memories that will be treasured forever. His kind words me get through hard times and I am here for all of you. Much love through the tears. Sorry we sent you to VietNam to fight. Thank you for waging peace. Years ago Dave called me that he had a long layover at LaGuardia Airport and I met him and spent some time talking and laughing while having some drinks. That's the way I will remember him and for his intelligence and civil manner. Too bad the good ones die too young. I've known David since he started his studies at the U of C. Great guy. Great heart. Great spirit. Always a pleasure to spend time with. He'll be sorely missed by many. I remember David taking us to Laurel, Mississippi, to march in support of chicken farm workers who were horribly abused by their employers. There were KKK about but it didn't stop Dave, and so we followed. He was a natural teacher and a generous spirit. I am saddened. We go back to decades ago ~ over these many years I've appreciated Dr. David Curry's energies and his person. There was some Internet communication in recent years, and almost, a direct telephone call too. I know and I feel, his good works and good energies will continue on. I did not know Dave personally though I may have seen him at rallies and picnics. I deeply appreciate all the work he has done at VVAW. He will be missed a lot. The world lost an incredible human being. I'm absolutely devastated. I'm so lucky that Dave was my mentor and friend during grad school at WVU. Dave and Janet were my surrogate parents during that time. I was with them 24/7. They fed me, supported me, and treated me like their son. He was a big influence on the person I became. Love you Dave, I'll never forget you brother. may peace finally attend thee dr. curry. I will miss you my brother. Dave will be greatly missed by many. He has certainly made a positive mark on the world. I just made a donation here in his memory, though there didn't seem to be a place to indicate the memorial. May that help to continue his good work. What a loss. He was a warm spark with a sense of humor and always welcoming. A fighter for justice. I will miss you, Dave. Deepest sympathy for his family. I only knew David for one year when we both attended junior college in Gautier, MS. We were the misfits then, four of us, and he was a true friend. I even have some of his poems he wrote back then. I knew he was special then; but am still amazed at all he accomplished. I wished I'd searched for him sooner. Dave was our statistician in civil rights and voting rights cases when he was on faculty at the University of South Alabama in Mobile. More than that, he was a dear friend, and a courageous advoctate. I was with Jim Blacksher and David on those civil rights cases and recently was able to visit with David. I have never known anyone with a greater passion and sensitivity for justice and peace. I was fortunate to know and work with him. I told David that his Professor Emeritis condition was always fatal. I was fortunate to work with him in civil rights cases with Menefee and Blacksher. I even was more fortunate to have him as a dear friend. A family friend. My mama loved him, and his daddy loved me. And David and his wife introduced me to Fraggin Willy. Its going to be hard to figure out the world without David. 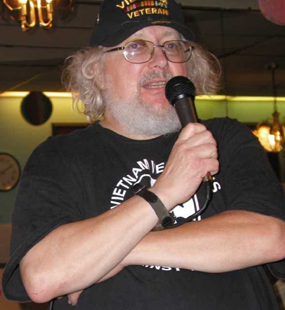 I am one of the few here that did not know David, though I am grateful to have learned about his inspiring life & times thru VVAW's newsletter & emails. I won't say RIP; an energetic spirit like this isn't about to be lulled into inaction so easily!